“We toured the UK twice around the last album and had a great time. We made loads of new friends and we can’t wait to hit some of the same cities and see some familiar faces. We’re really looking forward to seeing how the new stuff goes down live and we’ll be working hard between now and September to make sure each show is completely killer”, says guitarist Ade Mulgrew. York’s premier prog. 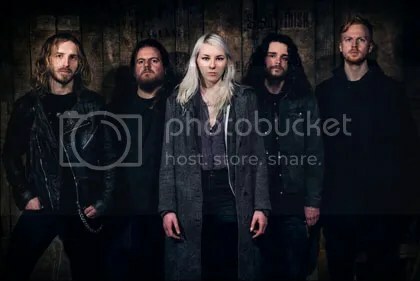 Celtic metal band Cryptic Age have announced the addition of new flautist and backing vocalist Shendie to their line-up. Cryptic Age are also currently working on their next release – Details to be announced. Waylander have been influencing and pillaging the folk metal scene since their formation in 1993. The last 19 years has seen the band release two demos and three albums, with the fourth album, Kindred Spirits, to be released in July (unless you’re unlucky enough to be living in North America, then you’re waiting until August). The album kicks off with Echoes of the Sidhe, which has an appealing introduction, being composed of melodic tin whistles and snarling guitar riffs. The vocals are astringent and unrelenting, adding to the vicious sound of the guitars and drums while the flute medleys add a more harmonious effect to the song. The guitar solo and the folky section that follow have a very defined, august sound. Lámh Dearg begins with a beautifully played acoustic section before the roaring guitar riffs make themselves heard. The acoustic sections are quite dominant throughout the song, creating a unique sound with the more heavier sections of the song and the harsh vocal work. Some of the melodic licks and riffs are pleasant to hear, giving the song a very varied sound. Twin Fires of Beltine begins sounding like a semi-heavy power metal anthem with Celtic influences. Compared to the last two tracks, Twin Fires is relatively more laid back, portraying more of a Celtic hard rock sound than a folk metal sound. The melodic use of tin whistles add a certain beauty to the song whilst the cleaner vocals in the chorus add some folky flavouring to the track. The most interesting part of the track is the combination of narration and an instrument I can’t quite recognise. Of Fear And Fire teases the listener with a slow and dark acoustic passage before the menacing and fierce riffs echo through the speakers. The first vocal passage sounds like an early Gorgoroth before taking on the death metal guise. The tin whistles blend in majestically with everything else in the track. Grave of Giants bewitchingly soothing melody whilst the monologue speaks of beautiful landscapes and untainted rivers, far from the “over-populated, polluted and so-called civilised” cities. The following track, A Path Well Trodden, changes the pace and sound rom the last track into something more hostile and warlike yet alluring and statuesque at the same time, however, the tin whistles are the one part that really do stick out in this magnificent painting of sounds. The album steps up a few levels with the heaviness in the form of Quest for Immortality, a song that utilises a staunch use of both harsh and clean vocals with a charming use of tin whistles and barbaric drum patterns. The guitars combine a near-perfect use of melody and aggression that dances well with the tin whistles. The haunting sound of Erdath gently rings out next, complete with almost-choir like vocals and a dark atmosphere, before the sudden transformation into a raging beast of double bass drums, energetic riffs and thunderous vocals. Of course, the track is full of aggression and speed as there is a section in the second half where it remains heavy but is relatively slower and gloomier, much like a doom metal track. The album ends with the title track, Kindred Spirits, which begins with an alluring tin whistle medley before the assault of guitars and drums begin. The vocals sound raw and much more harsh than on the other tracks, which I think really does add to the sound of the song. The tin whistles add the beauty to the beast that are the guitars and vocals, making the song harmonious yet chaotic – In the good sense of course. Kindred Spirits really is the stand out track of the album. After listening to the album, I see why Waylander are an influential band. 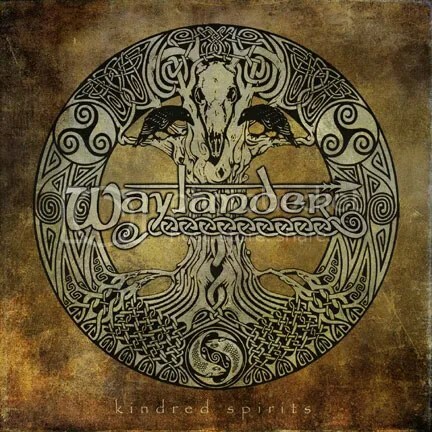 I’ve never really listened to the band before so Kindred Spirits was something new for me and it definitely displays Waylander’s sound perfectly. Everything just seemed to fit together in the album to create a folkin’ masterpiece and Celtic goodness.